I thought it was worth sharing some of that information here. 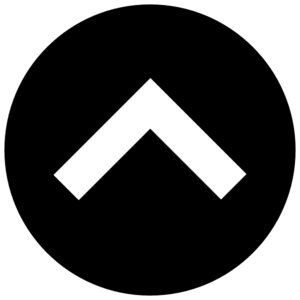 To do that, I'll first demonstrate information on the 50 largest venture capital deals globally for each year between 2007 and 2017. The first chart here, shows the increasing average size of the largest deals. The average size among the 50 largest venture capital deals globally was $109 million in 2007. It steadily increased until 2013, when things really took off—average deal sizes among the Top 50 in 2016 and 2017 were, respectively, $872 million and $867 million. But, we also know that venture capital overall has expanded during this period, and deal sizes have gone up. Have the largest deals kept pace? Yes, and they've actually exceeded it. The capital invested in the 50 largest deals annually grew from $5 billion in 2007 to $44 billion in 2016 and $43 billion in 2017 (blue bars). That growth exceeded the pace of total venture capital growth during the period (orange line), as the largest 50 deals accounted for 12 percent of global venture capital investments in 2007, but 31 percent by 2016 and 27 percent in 2017. I repeat, the 50 largest venture deals each year now account for about one-quarter to one-third of total venture capital investments on the entire planet. When you look at individual companies, many of which receive multiple rounds of very large investments, it's even more concentrated (more on that below). Here's a stat for you: 18 companies accounted for 1 of every 7 venture capital dollars invested globally between 2015-2017. All but one of these companies was in China (12) or the US (5). As I mentioned before, the largest deals are coming from two places—China (increasingly) and the United States (decreasingly). The chart below shows each country's share of the largest 50 global deals, along with the share account for by all other countries. More than 80 percent of the largest 50 deals in 2007 occurred in the United States, whereas 36 percent are today. The decline in the US share since 2014 is accounted for almost entirely by the rise of China, which now accounts for 42 percent of the largest 50 deals globally. 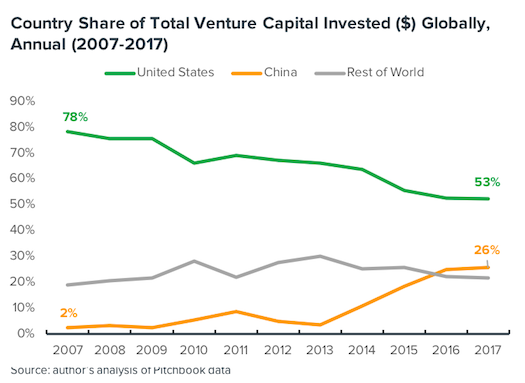 This follows a broader trend of China gaining a larger share of overall venture capital investments, as seen in the chart immediately below here. But, but, but... as the second chart shows, China isn't increasing it's global share of deals. Why the dichotomy? China is capturing a greater share of global venture dollars but not a global share of deals, because of a few companies that are taking in extremely large quantities of capital. China's rising market share isn't being driven by a massive increase in the number of companies being funded. Finally, here's a look at some of the individual companies receiving the biggest deals between 2015-2017. Each of the companies listed received at least one venture round of $500 million and above during this period. Some of them received multiple rounds at or above that threshold. The dollars invested includes only investments at or above the $500 million threshold. Of the 79 reported rounds at or above $500 million, 33 (or 42 percent) were in China, while 28 (or 35 percent) were in the United States (for a combined 77 percent of such deals globally). Of the 61 unique companies receiving such investments, 24 (or 39 percent) were in China, while 20 (or 33 percent) were in the United States—demonstrating that Chinese companies receiving large venture rounds are more likely to do so more than once.